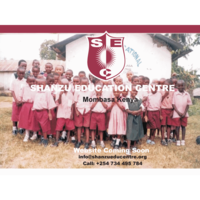 Shanzu Educational Centre is a project of Nyaeri Self Help Group a community based organization with its operational base in Shanzu Village, Mombasa, Kenya. The Centre was established in 2003 with the goal of providing educational support to children abandoned, orphaned by the HIV/AIDS pandemic and the less privileged. Shanzu Educational Centre offers both formal education and informal education. The formal education consists of basic primary school education following the 8-4-4 curriculum while the informal education entails training in dressmaking/tailoring and entrepreneurial skills, and yet to start are; carpentry and joinery, welding and fabrication, computer, masonry and welding. Priority objective for the Self Help Group is to rehabilitate and upgrade the Centre, establish a feeding programme, construction of a dispensary, sinking of boreholes, Sensitization of the of community about HIV/AIDS and drug abuse, imparting of entrepreneurial skills, initiating of viable income generating projects to the community and providing of loans to sustain them. An approved and detailed plan out look has already been prepared and indicates how the learning Centre will look upon completion of the project. The approximate budget for the project and cost is $ 96,125.00. Toward this end the Self-Help Group is seeking donor funding from well wishers to grant the kids at the centre an opportunity to achieve their full potential.